Is it legal to sell Antiques from SHIPWRECKS? Is it legal to sell and to import shipwreck ceramics? Our arrangement with the Malaysian government is such that all excavations are done in co-operation with its Ministry of Culture, Arts and Tourism and the National Museum. Under that arrangement, we finance all the search for shipwrecks, carry out the excavations and research and then produce the final reports. After sharing the recovered artefacts with the Government, we are allowed to sell our portion. 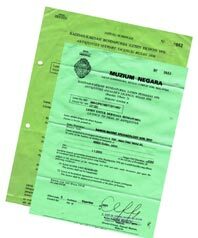 As and when required, we apply for an Export Licence that allow us (or the buyer) to export the artefact from Malaysia. This permit will assist, not only export from Malaysia, but also import into certain countries demanding export license from country of origin. How do you date shipwrecks and its ceramic cargo? The loss of 14th to 16th century ships are not recorded and no survivor's reports can be found. It is therefore difficult to know when any single vessel sank. A search for the most likely date begins with an examination of the ceramic cargo that is part of every wrecksite thus far investigated. With a serie of such shipwrecks, it becomes possible to chronologically arrange the different ceramic cargoes based on known production sequence. After this, we compare technical as well as stylistic evidences by cross-referering with ceramics found on other dated shipwreck sites. Finally adding the ships construction details, design, wood used and known historical events leading to possible transfer of technologies and after a final comparison with carbon 14 dating, our dates for each shipwreck are likely to be as close as +/- 20 years. Why are some shipwreck ceramics not as 'glossy' as antique pieces found elsewhere? First of all, be careful with "antique" ceramics that looks new. It is pretty obvious that any historical artefacts will have some evidences of use. Earlier high-fired pottery are most often covered with a glaze containing iron oxides. If the ware is not fired at sufficiently high temperature to fully dissolve iron oxides in the glaze, it will crystallize on the surface. Once in contact with salt water, the crystals corrode, slowly pit the surface and eventually 'wear' the surface. The amount of deterioration often vary dependent on the duration of stay on the seabed. This effect is in fact, proof that the piece is old and that it has been recovered from the sea. 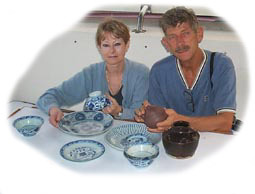 How are the shipwreck ceramics treated after recovery? Centuries of submersion in salt water, at great pressure, allows salt to penetrate deep inside glaze cracks. This must be removed as it otherwise will destroy the surface. This is a rather complicated process that is best described as de-salination. By soaking the ceramics in fresh water for months and constantly monitoring the salinity levels, accumulated salt is eventually removed. Calcarous growth is first mechanically removed. The affected areas are then washed with mild Hydrochroloic acid followed by repeated rinsing in destilled water. Ceramics showing glaze-wear are sometimes stabilised with an acrylic solution. This coating does not affect the ceramics and, if so desired, can be removed by submersion in white spirit. Also note that we do not repair damaged or chipped pieces. The only time we done so, the repair was noted in the Certificate of Authenticity. Good question, as many manufacturers today know how to make newly made pieces 'look antique'. In some instances, they will bury their wares in the sea for a while, allowing seashells (most often barnacles) to grow on the surface. A trick that fool most buyers and sometimes experts as well. Don't take our word for it. The Museums listed below, their professional personell and other independent scholars whom we often consult, will confirm that our shipwreck ceramics are real old and more accurately dated than most other ceramics on the markets. 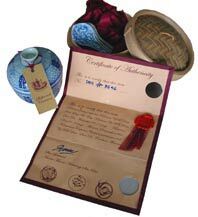 In addition to this, we issue a Certificate of Authenticity stating the age and the source of every item purchased. We also supply a small booklet with every piece, providing general background on the shipwreck and the objects manufacturing and history. Where can I see your shipwreck collections? To start, you can visit our online version of the exhibition we did in the National Museum in Malaysia 2001 to 2005. Click here to visit and online version. Can I get personal references to the authenticity of your ceramics? The Company's researchers work closely with international scholars. Should you feel more comfortable with an independent opinion, visit the museums listed above and speak to their curators. We do not include this FAQ page to keep our customers from asking questions . We do want anyone who are uncertain about our integrity or professionalism to contact us. We know the antique market better than most and therefore also understand the many doubts you may have. In fact, we prefer that new and old collectors stay in contact with us and, if at all possible, visit us in our stores in Endau, Malaysia. National Museum, Kuala Lumpur, Malaysia. Jingdezhen Ceramic Institute Museum, Jingdezhen. China. Pacific Asia Museum, California. USA. Asian Art Museum, California. USA. produced numbers of reports beneficial to further work on Thai ceramics. The artifacts sold on this website are therefore legally and properly excavated and can be supplied with an export permit from the Department of Museum in Malaysia should this be required. This unique working arrangement makes us one of the few Internet sellers that sell from own excavation and deliver a meaningful Certificate of Authenticity with all artifacts with a serial number. CY Tung Maritime Museum at the Jiao Tong University, Shanghai. China. Far Eastern Antiquities Museum, Sweden. Art Museum, The Chinese University of Hong Kong.